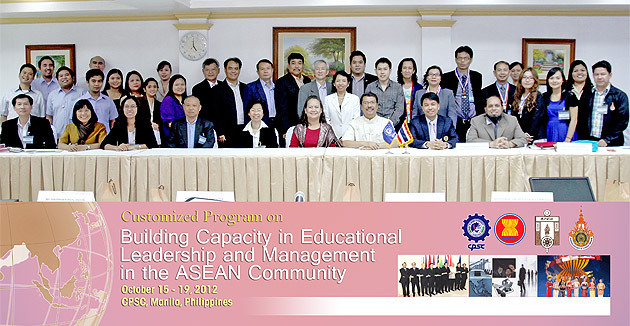 CPSC’s Customized Program on “Building Capacity in Educational Leadership and Management in the ASEAN Community” kicked off on October 15, 2012 at CPSC, Manila, Philippines with 22-strong participants composed of educators from nine different campuses of Rajamangala University of Technology System (RMUT). The delegation was led by the University President, Assoc. Prof. Dr. Numyoot Songthanapitak. The Director General of CPSC, Dr. Mohammad Naim Yaakub led the Faculty and staff in welcoming the President of RMUT and the university’s academic team at the inaugural ceremonies of the week long program. Dr. Naim extended CPSC’s profound gratitude to member country Thailand through RMUT for the confidence it has continually bestowed upon CPSC since they rejoined CPSC in 2008. He added that CPSC, putting premium to quality, having been recently confirmed for continued ISO 9001:2008 certification, is committed to provide and deliver quality programs for RMUT through the said Customized program. The Director General also underscored that the program symbolizes CPSC’s strong ties with RMUT.